“On the 1st of March, 1851, D. R. Disbrow purchased the Mason St. 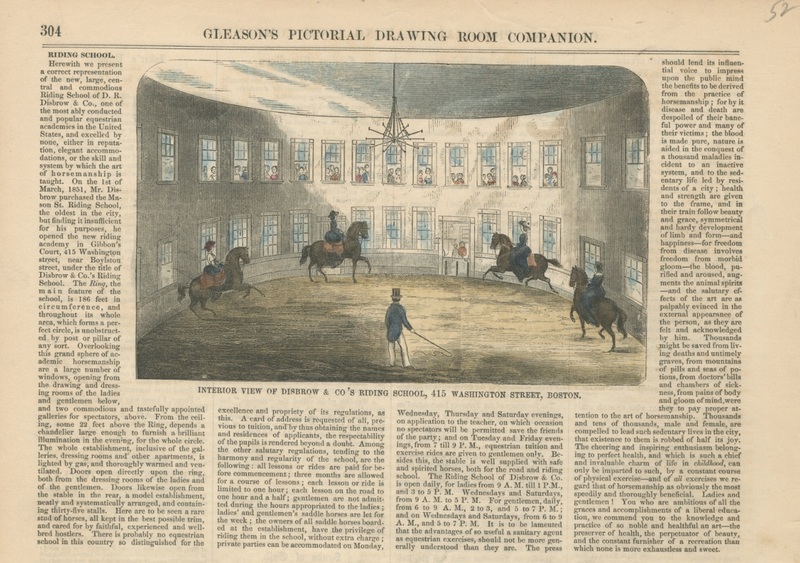 Riding School, the oldest in the city, but finding it insufficient for his purposes, he opened the new riding academy in Gibbon’s Court, 415 Washington street, near Boylston street, under the title of Disbrow & Co.’s Riding School. The Ring, the main feature of the school, is 186 feet in circumference and throughout its whole area, which forms a perfect circle, is unobstructed by post or pillar of any sort. 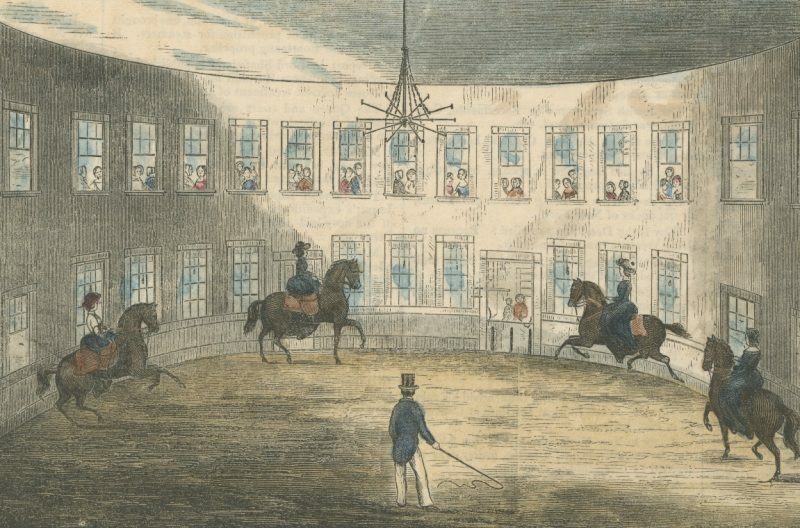 Overlooking this grand sphere of academic horsemanship, are a large number of windows, opening from the drawing and dressing rooms of the ladies and gentlemen below, and two commodious and tastefully appointed galleries for spectators above. From the ceiling, some 22 feet above the Ring, depends a chandelier large enough to furnish a brilliant illumination in the evening, for the whole circle. The whole establishment, inclusive of the galleries, dressing rooms and other apartments, is lighted by gas, and thoroughly warmed and ventilated. Doors open direct upon the Ring, both from the dressing rooms of the ladies and of the gentlemen. Doors likewise open from the stable in the rear, a model establishment, neatly and systematically arranged, and containing thirty-five stalls. Here are to be seen a rare stud of horses, all kept in the best possible trim, and cared for by faithful, experienced and well-bred hostlers. There is probably no equestrian school in this country so distinguished for the excellent and propriety of its regulations, as this. A card of address is requested of all, previous to tuition, and by thus obtaining the names and residences of applicants, the respectability of the pupils is rendered beyond a doubt. Among the other salutary regulations, tending to the harmony and regularity of the school are the following: all lessons or rides are paid for before commencement; three months are allowed for a course of lessons; each lesson or ride is limited to one hour; each lesson on the road to one hour and a half; gentlemen are not admitted during the hours appropriated to the ladies. Ladies’ and gentlemen’s saddle horses are let for the week; the owners of all saddle horses boarded at the establishment, have the privilege of riding them in the school, without extra charge; private parties can be accommodated on Monday, Wednesday, Thursday and Saturday evenings, on application to the teacher, on which occasion no spectators will be permitted saved the friends of the party; and on Tuesday and Friday evenings, from 7 till 9 P.M., equestrian tuition and exercise rides are given to gentlemen only. 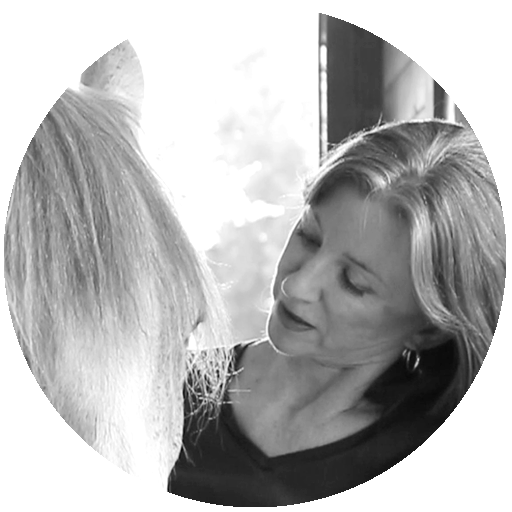 Besides this, the stable is well supplied with safe and spirited horses, both for the road and riding school. The Riding School of Disbrow & Co. is open daily, for ladies from 9 A.M. till 1 P.M., and 3 to 5 P.M., Wednesdays and Saturdays, for 9 A.M. to 5 P.M. For gentlemen, daily, from 6 to 9 A.M., 2 to 3, and 5 to 7 P.M.; and on Wednesdays and Saturdays, from 6 to 9 A.M. and 5 to 7 P.M. 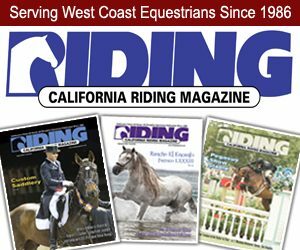 It is to be lamented that the advantages of so useful a sanitary agent as equestrian exercises, should not be more generally understood than they are. The press should lend its influential voice to impress upon the public mind the benefits to be derived from the practice of horsemanship; for by it disease and death are despoiled of their baneful power and many of their victims; the blood is made pure, nature is aided in the conquest of a thousand maladies incident to an inactive system, and to the sedentary life led by residents of a city; health and strength are given to the frame, and in their train follow beauty and grace, symmetrical and hardy development of limb and form–and happiness–for freedom from disease involves freedom from morbid gloom–the blood, purified and aroused, augments the animal spirits–and the salutary effects of the art are as palpably evinced in the external appearance of the person, as they are felt and acknowledged by him. 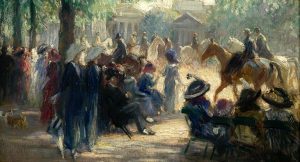 Thousands might be saved from lingering deaths and untimely graves, from mountains of pills and seas of potions, from doctors’ bills and chambers of sickness, from pains of body and gloom of mind, were they to pay proper attention to the art of horsemanship. Thousands and tens of thousands, male and female, are compelled to lead such sedentary lives in the city, that existence to them is robbed of half its joy. 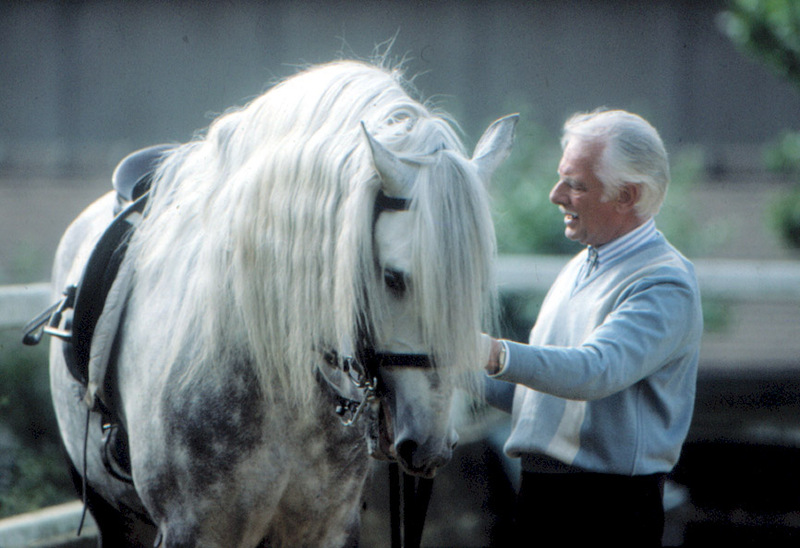 The cheering and inspiring enthusiasm belonging to perfect health, and which is such a chief and invaluable charm of life in childhood, can only be imparted to such, by a constant course of physical exercise–and of all exercises we regard that of horsemanship as obviously the most speedily and thoroughly beneficial.